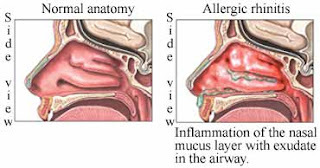 Allergic rhinitis is the most common cause of rhinitis, which indicates inflammation of the mucous membrane of the nose. Allergic rhinitis usually causes inflammation not only in the nose but also in the surrounding areas which include eyes, eustachian tubes, middle ear, sinuses and throat. People who have allergies are frequently advised to avoid the substances that cause sneezing, wheezing, runny nose, tear-filled eyes, itching, inflammation, and hives. Allergy sufferers may be asked to give away pets and potted plants. They can be told they have to keep their bedroom windows tightly shut at night. They may be told that they need to avoid food sensitivities, so they can't eat anything made with wheat, meat, citrus, tomatoes, chocolate, cheese, milk, or eggs. And they may be told that they can't stay friends with people who like to use perfume or aftershave. 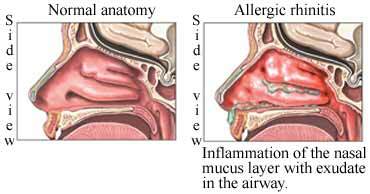 The signs and symptoms of allergic rhinitis can be mild or severe. You may also experience severe symptoms that will last from 4 days to 4 weeks. Chronic congestion is one of the most common symptoms of this condition. This symptom may cause pain and facial pressure and this may affect your sense of taste and smell. The skin right below your eyes may redden and swell. The symptoms of allergic rhinitis may occur immediately after you are exposed to certain substances that trigger an allergic reaction. Some of the most common allergens include dust, pollen and animal dander. In some cases, exposure to perfume or cigarette smoke can also worsen your condition. Avoid keeping animals that shed fur. Animal dander is a well known trigger for allergic rhinits. If you already own an animal or are keen on keeping one, keep your pet away from your bedding and bathe your pet regularly. Most studies show an association between air pollutants and the exacerbation of allergic conditions. During periods of haze, patients with allergic conditions should avoid unnecessary outdoor activities. The range of occupational sensitizers is very large and complex, and will require assessment by a specialist. True food allergies are uncommon, and exhaustive testing for food allergies is usually impractical. Encase pillows, mattresses etc with allergen-proof, anti-dust mite covers. Wash all bedding and stuffed toys in hot water (exceeding 60 degrees Celcius) once a week. Avoid carpets, thick curtains and stuffed toys where possible. Use vacuum with integral, HEPA filters. Keep all clothing in drawers/closets to reduce dust collection. Clean all surfaces with a damp cloth regularly. Regularly change and clean air conditioner filters.